In Washington, D.C., ethanol production jumped up from the previous week and represents a new all-time record, with an averaged 1.108 million barrels per day (b/d)—or 46.54 million gallons daily, according to government data released and analyzed by the Renewable Fuels Association. The four-week average for ethanol production increased to a record 1.076 million b/d for an annualized rate of 16.50 billion gallons—about 6% higher than a year ago. 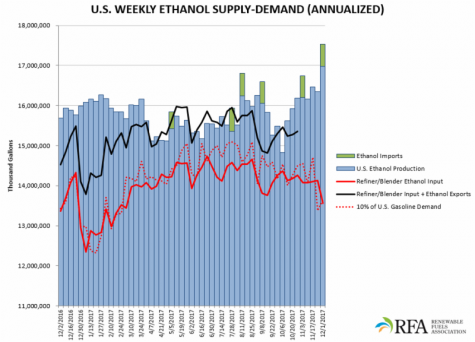 Stocks of ethanol were 22.5 million barrels. That is a 2.3% increase from last week and a 25-week high. Stocks are 22% higher than year-ago levels. Imports of ethanol were 36,000 b/d—the first time in four weeks that import volumes were logged and only the sixth week for imports in 2017. Average weekly gasoline demand increased 2.0% to 373.6 million gallons (8.895 million barrels) daily. That is equivalent to 136.4 billion gallons annualized. Refiner/blender input of ethanol decreased 4.0% to 885,000 b/d—a 39-week low, which is equivalent to 13.57 billion gallons annualized. Expressed as a percentage of daily gasoline demand, daily ethanol production increased to the highest rate in 44 weeks at 12.46%.